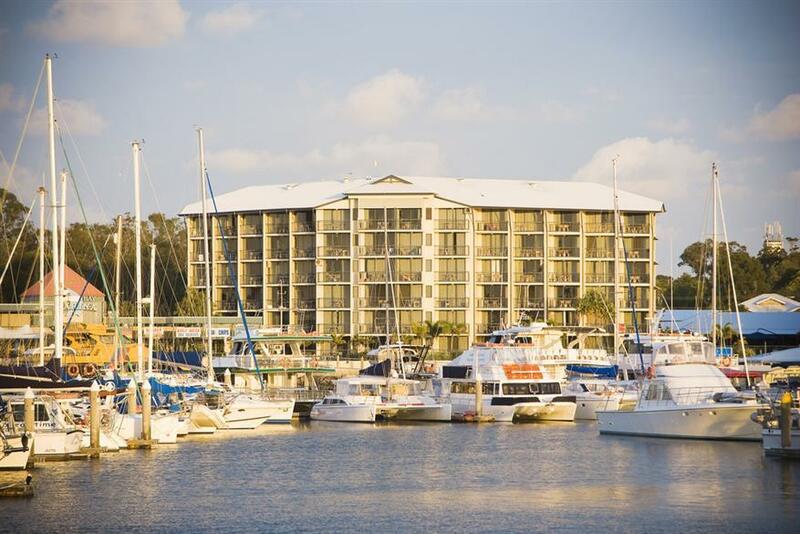 Mantra Hervey Bay on Queensland's Fraser Coast is situated right on Urangan Marina in Hervey Bay, the gateway to the Great Sandy Straits and Fraser Island. This Hervey Bay resort offers comfortable furnished hotel rooms and suites, with all rooms offering marina views and views to Fraser Island. Hervey Bay is famous for being the best location in Queensland to see migrating humpback whales from late July through to November each year. The Fraser Coast area also offers great fishing, recreational boating and the beach areas have calm seas - perfect for sailing, kayaking and swimming. Hervey Bay is also the launching point to Fraser Island, the world's largest sand island. Guests at Mantra Hervey Bay can explore Fraser Island by joining one of the many day trips. Whale watching cruises also depart from the marina right in front of the resort. As well as offering a prime water side location, Mantra Hervey Bay also features a swimming pool area, sauna and steam room, shops within walking distance and several restaurants along the esplanade, which is a short stroll away. 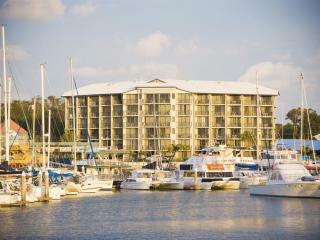 Mantra Hervey Bay offers 158 resort accommodation rooms including hotel rooms, one, two and three bedroom suites. 1 Bedroom Apartment: Features kitchenette and laundry facilities. Bedding is 1 King Bed. 1 Bedroom Spa Apartment: Features spa bath, kitchenette and laundry facilities. Bedding is 1 King Bed. 2 Bedroom Apartment: Consists of an adjoining Hotel Room and 1 Bedroom Suite. Bedding is 2 King Beds OR 1 King Bed + 2 Single Beds. 3 Bedroom Apartment: Consists of an interconnecting Hotel Room and 2 Bedroom Suite. Bedding is 2 King Beds + 2 Sofa Beds OR 6 Single Beds. 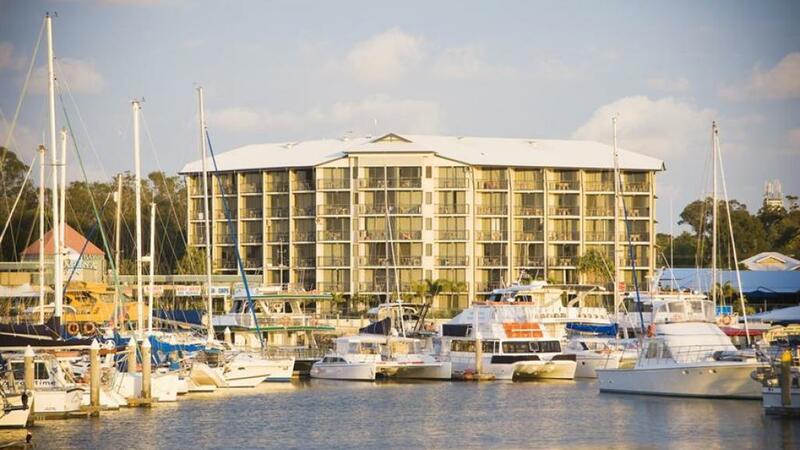 Take in the marina views as you sip a cool drink in the adjoining restaurants or cafes. Better still, try your own maxibar, where you order from a menu and enjoy your drinks from your own balcony whilst watching the happenings of the marina. Hervey Bay Boat Club: Offers bistro dining, full bar and entertainment. Sit outside on the deck and enjoy the marina views. Apartment looking a little tired. Could use a refresh. Comfortable though and we enjoyed our stay thanks. Great for what we wanted. Hotel and room was great - clean and well positioned. Café Ballena was also great and we went there for dinner and breakfast.